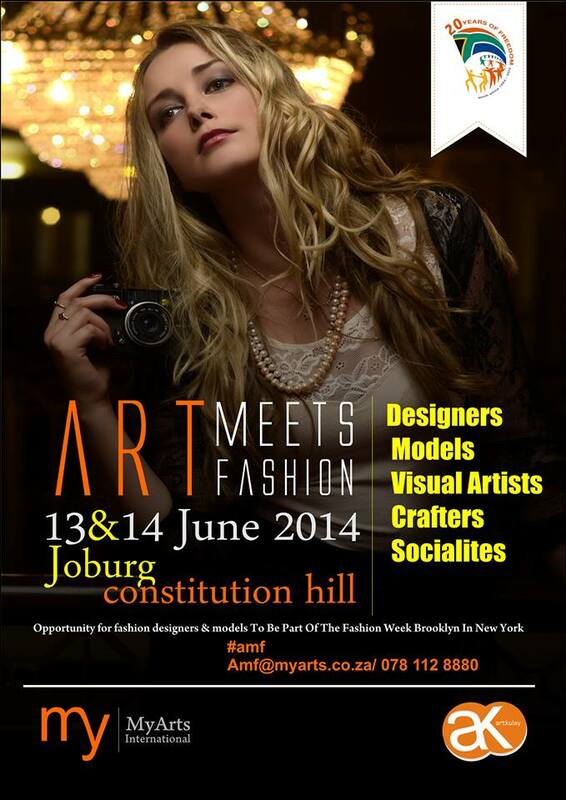 MyArts International will be hosting the Art Meets Fashion Joburg this Friday the 13th and Saturday the 14th of June 2014 at the Constitution Hill (Basement). The event aims at creating a platform for collaboration in the creative industry and giving an opportunity to local visual artists, crafters , models and designers to showcase their talents in fashion, modelling, film, visual and performing arts. The Art Meets Fashion Joburg will give entrepreneurs in the creative sector an opportunity to network with other entrepreneurs from different fields, trade and discuss about various opportunities and challenges in their field of work while sharing some drinks. The event will incorporate an arts exhibition, craft market, fashion showcase, modelling workshops and creative business expo. The mission of this program is to create a local and global partnership for development in order to foster job creation and to support the growth of new and existing businesses by providing capacity building information, tools and resources. Our focus is to develop and empower businesses within the arts fraternity and business sector in order to strengthen their business capability and survivability. A modelling workshop will be held on both days from 12:00 to 14:00. The aim is to give young men and women who are interested in modelling and fashion free information on the industry. The workshop will focus on photography, catwalk and tips about the modelling industry. 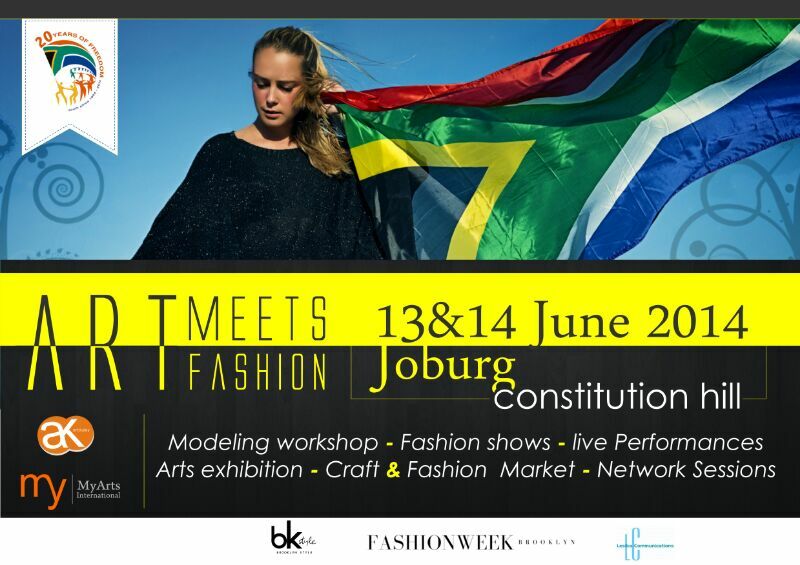 Interested models must meet at the Constitution Hill at 11:00 to 11:30 for registration. The workshop is free as we believe that the door of culture and education shall be opened to all. Designers from Gauteng, Mpumalanga and the North-West Province will showcase their garments during the various shows and fashion installations. Our relationship with the Brooklyn Style Foundation gives the participating designers an opportunity to showcase on the 4th of October 2014 at the Fashion Week Brooklyn in New York where the BK Style in partnership with MyArts will be hosting a South African show dedicated to the 20 Years of Freedom and Democracy. The event will also include some promotional activities and Arts Development Forums where artists will be informally talking and networking while sharing drink and meals. MyArts International wants this event to serve as a platform to seek out and nurture young, disadvantaged artists and allowing them to reach their potential and enhance the world around them by setting an example of giving, hope and achievement. According the MyArts’ Chief Director, Mr. Denis Ackulay, artists will be celebrating the 20 years of Freedom and Democracy this weekend during the Art Meets Fashion Joburg. “It’s not just a platform for collaboration but also a weekend of celebration as SA celebrates youth months and 20 years.” Active citizenship is very important within the Art Fraternity. It is this generation’s task to reignite the true engine of the Millennium Development Goal #8, which is Global Partnerships for Development established under the United Nations 2015 Program. “We should think of restoring the ideal of people working together and collaborating and exchanging ideas,” he added. The event will also feature an Anti-Rhino Poaching Campaign with an auction where funds will be channels to Anti-Rhino Poaching Organisations.